During your first visit, Dr. Sherin will ask you to fill out a medical history form. This includes your chief complaint as well as your family history, dietary habits, other care you may have had (chiropractic, osteopathic, medical, etc. ), your job, and other questions to help determine the nature of your illness and the best way to go about treating the problem. A physical examination will be performed including neurological testing, range of motion, and motion palpation. In addition, a careful spinal examination and analysis will be performed to detect any structural abnormalities which may be affecting or causing your condition. All of these elements are important components of your total health profile and vital to the doctor of chiropractic in evaluating your problem. ICC has significantly enhanced the practice with the addition of a new high-tech, outcome assessment instrument – The Insight Subluxation Station – so that we may better serve our patients. 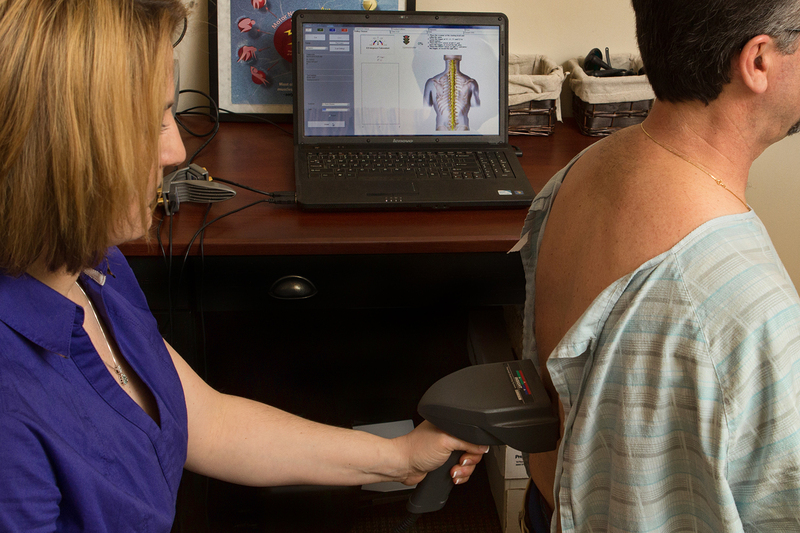 This technology features painless and non-invasive tests that will help characterize abnormal activity surrounding your spine. This activity can be associated with a subluxation which could lead to other health issues. The Insight Subluxation Station, which is certified by the Space Foundation in cooperation with NASA, helps us to identify these problems before they become symptomatic. Doctors of chiropractic spend years learning motion palpation (the art of examining by movement or touch) and other forms of spinal examining procedures, so that they can administer specific and appropriate spinal adjustments. Once Dr. Sherin has identified the problem, she will begin care by way of adjustments or manipulations. Particular attention will be paid to that area of your spine where a subluxation has been detected. The adjustment is usually given by hand or and consists of applying pressure to the areas of the spine that are out of alignment or that do not move properly within their normal range of motion. Treatment may also include soft tissue manipulation as well as other modalities such as electric stimulation, hot or cold packs, or ultrasound to relax the muscles and surrounding tissue. Doctors of chiropractic use many sophisticated and varied techniques, and the specific procedure to be used will be determined and explained completely to you following a careful evaluation of your history and physical findings.